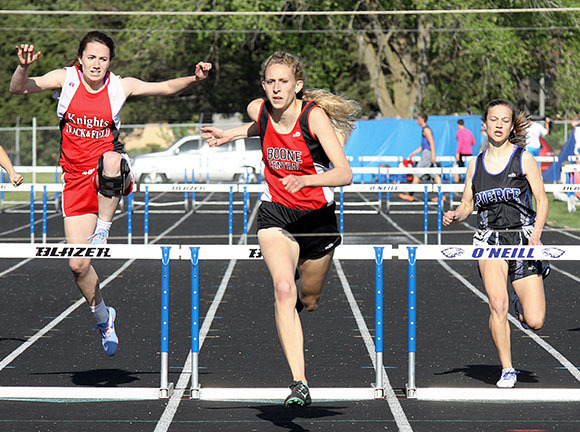 Some athlete’s hopes and dreams were swept away by the gusty winds at Thursday’s B4 District track and field meet in O’Neill, while others rode the brisk currents to cherished berths in the 2016 Nebraska State Track and Field Championships. Eleven Boone Central/Newman Grove Cardinals will make the coveted trip to Omaha Burke Stadium May 20-21 after qualifying for the state meet in B4 competition. Led by double gold medalists Sheldon Beierman and Ashlynn Baker and a victorious 4×100 meter relay team, the BC/NG Lady Cardinals, defending district champions, were runners-up at O’Neill to Scotus. The Card boys had one event champion – senior Isaac Sullivan in the shot put – and placed fifth in the team standings. Cardinal Coach Kris Pestel said it was another example of the work ethic and character of the Boone Central/Newman Grove athletes – especially a talented core of seniors. “I am really proud of how our kids competed,” Pestel praised. “They, once again, left everything they had on the track, representing our communities with heart, grit and determination. “Damian Backus broke his own (Boone Central) record in the long jump, going 21’9½. We also had 18 girls’ season bests, 14 boys’ season bests, 11 state qualifiers in 14 events, and the district runner-up trophy for the girls! Beierman highlighted her final district competition by running away from the fields in the 100 meter hurdles (15.32) and 300 meter hurdles (46.99). She joined teammates Tessa Hedlund, Kelsey Thompson and Celine Dunlap to win the 4×100 relay (52.11) and qualified for state in the high jump with a third place finish (5’1). Baker was dominant in the distance races, winning the 1600 meters (5:37.19) and 3200 meters (11:58.28). Dunlap, along with anchoring the winning relay, took second place in the pole vault (9’7) to qualify for the state championships in that event. Sullivan capped a stellar senior shot put campaign with a B4 District victory (49’6¾). Damian Backus did not find the winner’s circle, but qualified for Omaha competition in three events. The BC senior placed third in the long jump with his school record 21’9½ leap and was third in a loaded 100 meter dash field (11.43). He placed fifth in the 400 meter dash (52.77) and, following the completion of all district meets, was added to the state meet field as an extra qualifier.